Beans are among the easiest of foods to sprout, and doing so helps to pre-digest them. Some (like lentils) can be eaten raw, though most people will digest beans best they're lightly steamed or cooked. Here are very easy directions for sprouting, and you find more inside our unlimited online classes. Soak 1-1/3 cups of beans overnight in pure water. Use a 1/2 gallon mason jar or other similarly-sized container. I like using 1/2 gallon mason jars with sprout screens best. But you can also use a stainless steel strainer or a stainless steel pot. In the morning, drain and rinse the beans well. A sprout screen is a great investment (but still inexpensive) you can make for your kitchen. You will need a canning jar metal band to hold it in place. Repeat the rinsing and draining every 12 hours, or each morning and evening. The maturing of the sprouts is a matter of preference. Generally, I sprout beans for around 3 to 5 days. 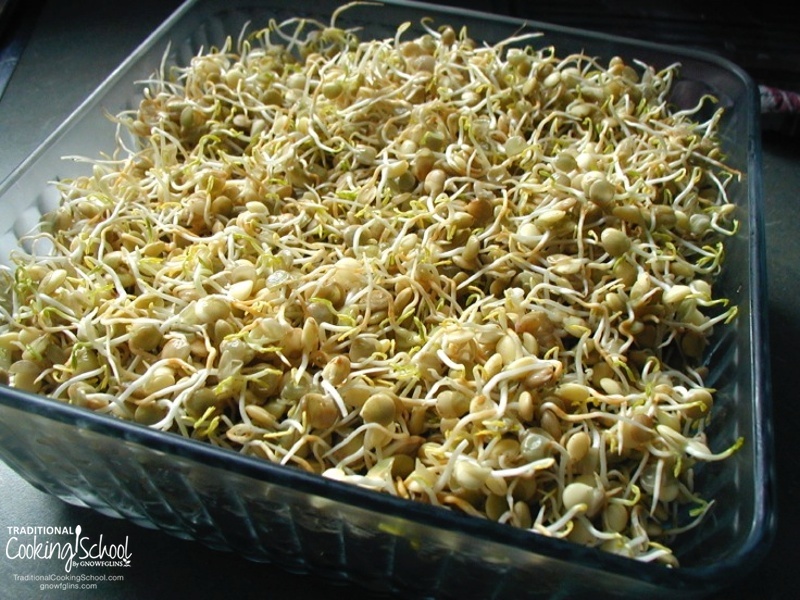 We don't prefer older mung bean sprouts because we find them more bitter when older, unless cooked (and we prefer to eat these sprouted beans raw in salads). Mung beans are shown in the top picture (click to enlarge). We like to eat them when leaves are just beginning to appear, colored in yellow-purple. If you plan to use them in a stew or chili, just a short tail is all that's needed to ensure they're pre-digested and ready to go! As you can see in the top photo, my mung bean sprouts are all curly, not thick and straight stalked like you'd find in the market. The way to get mung beans to have long, straight, thick roots is to sprout them in a container that allows them to keep that posture. Like a tray where they can stand tall and grow upright. I personally don’t worry about doing it this way. I grow mine in 1/2 gallon jars and they get curly because they're all jumbled in there. Just above are mature lentil sprouts. We like them when the first leaves have just appeared and are green. They get green just from filtered light coming through the kitchen window. Finally: storage. I take well-drained and rinsed bean sprouts and store them in the refrigerator in Anchor Hocking large glass storage dishes. (I love these storage dishes!) The cool temperature of the fridge will slow, but not stop, the growth of the sprouts. If not eaten within two days, you should rinse them again, to keep them fresh. 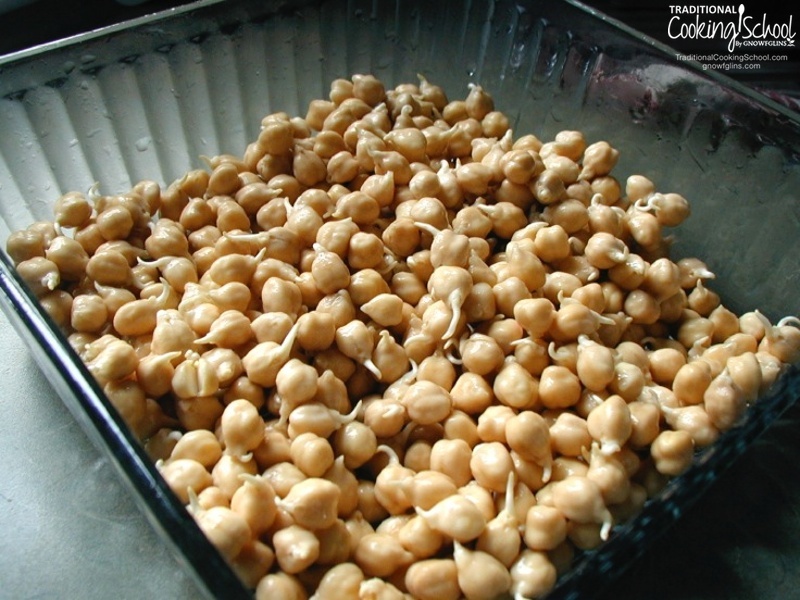 How To Sprout Beans — Step #4 — Eating! How do I use the sprouts? Well, mostly in salads, such as in this salad. You can also sprout other beans, such as kidney beans or pinto beans. Add them raw to salads or in soups. See Four (4) Yummy Ways to Use Sprouted Beans for more information and ideas. What beans do you love to sprout? 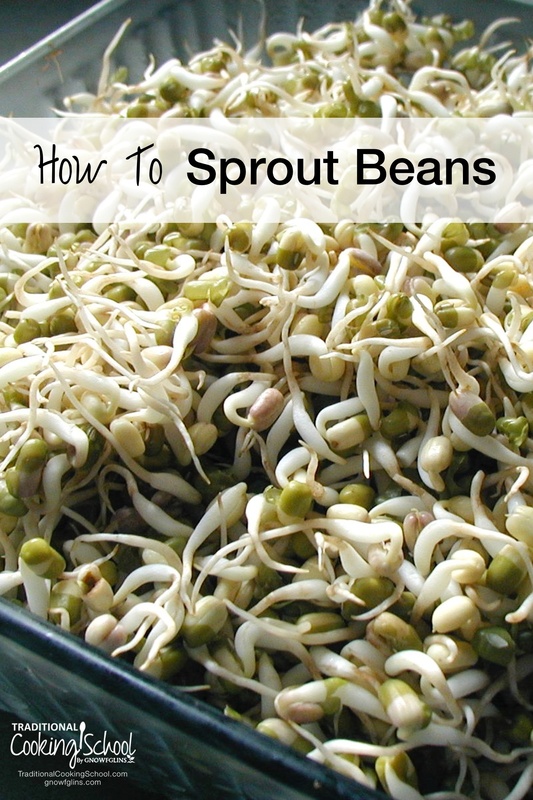 Do you know how to sprout beans? Want more help with soaking, sprouting, or fermenting? We help you learn the fundamentals (and more!) of traditional cooking in our unlimited online classes. This post was featured in 47 Trim Healthy Mama E Meals & Snacks With Traditional Foods. This may sound like a silly question: do you eat the beans then along with the sprouts? Or do you separate them and cook them? That’s not a silly question, it’s a good one! You eat the bean and the sprout that comes out of it as a unit, usually raw. However, older mung bean sprouts are often cooked. And the other exception is that sometimes people will sprout beans just a little bit before cooking them in a soup or something. The sprouts I’ve featured here are the ones that I grow for salads, and we eat the whole thing. Thanks for asking your question; I think it was helpful to clear up confusion that I caused by not being clear enough. I have never commented before, but enjoy reading your blog when I have time. We have traveled very similar journey’s. My family has also had major nutritional changes because of a gluten allergy from one of our children. This spurred us on to revolutionize our diet. We too follow, slowly but surely, a Nourishing Tradition diet, and we live near in Lebanon, OR a city near Albany if you have never heard of it. Imagine my surprise to discover you are also a Christian family. So it has been fun to read of your journey as it feels very familiar. I love that you write of your hits and misses in your recipes as this greatly helps and encourages my attempts at things. I too order from Azure and I had a question about the sprouting screens you bought from them. It looks like they are for regular and not wide mouth jars. Is this true? I have wide mouth half gallon jars and would like to start sprouting. Right now we buy Ezekiel bread for all but the gluten free child, but making my own would be more cost effective I think. I am glad to hear that your gluten free kids can eat your sprouted bread. My child’s allergy is a behavioral reaction allergy so I don’t hold a lot of hope that my bread will help, but I am hoping he will grow out of it some day. It is just a bear to test the allergy as it messes up his emotional and mental system for a couple of weeks. Well again thank you for all you do. I homeschool three of my four kids and I have so little time to experiment in the kitchen that seeing your results and ideas are very helpful. Hello, Alicia! I have loved reading what you wrote and hearing from you. I have heard of Albany, but I don’t think I’ve been there before. But I’ve been to Lebanon. I went to Willamette Univ. in Salem ages ago. When I graduated, a family I knew from Lebanon hosted a graduation party for me. I too find it very encouraging to read what other people are doing. It is inspiring to see what other people can do, and it is encouraging to see that everybody else is imperfect, too! 😉 Not that I glory in others’ deficiencies, just that I am glad not to be the only one! To answer your question, the sprout screens are for wide mouth jars. I have not seen regular mouth screens, ever. So you’ll be good to go if you get the ones from Azure. Please keep in touch regarding the sprouting and allergies. I am holding out hope that it will help you! I also have a child with behavioral reactions to gluten. He is celiac. I tried homeschooling him last year, but it became too much for my health, so had to return him to public schooling this year. I would love to correspond, as I have never met anyone else whose child’s reaction to gluten is purely behavioral. We had him tested last evening by a functional medicine chiropractor who is trying a new approach. I am eager to see how it works as regular western medicine approaches can only help to a point. I’ve been experimenting with various cooking strategies and nutritional interventions. My 3 year old has neurological reactions (anger, hyperactivity, inability to focus, giddiness to name a few) to gluten, soy, corn syrup, refined sugar, pistachios, peanuts and cashews. I noticed that her behavior was linked to food 9 months ago. It has been a journey, but she is so much better without the foods that cause her body distress, and she is able to understand what she can’t have and how it makes her sick. I always seem to have the same problem with my soaking process. This time I soaked the garbanzo beans for almost 24 hours and they are still crunchy in the center. What am I doing wrong? Lisa, I don’t believe this is a problem. My garbanzos are always still crunchy in the center after soaking. Soaking is not the same as cooking, which will soften them all the way through. What are you trying to achieve with the soaked garbanzos? Thank you for the pictures. I’ve finally started sprouting, and I wasn’t sure if they were supposed to look like what they do…I was expecting store-looking mung beans. I do think your roots are thicker than mine are. Not sure why they are so very skinny. This is awesome information. I am working on finding ways to eat mostly raw. I love beans. This is a huge help. Thanks. Thanks for this article and your website in general. I’ve had a gluten allergy for years and ignored it – yes, some very ill times behind me, and all my fault too! 😮 I need to make some (for me) drastic dietary changes, and sprouting seems to be a manageable and helpful place to start. Thank you again! I have read that kidney beans are toxic when eaten as a sprout. I too have read that eating raw kidney beans is toxic. True? Also, would that hold true for other beans. I’m soaking adzuki beans right now for the first time. From what I’ve read, it is a nutritionally better way to ingest beans….lowers the phytic acid or anti-nutritive qualities. Thanks for this blog! Christine, I have read that. Nourishing Traditions says to cook kidney, lima, and black beans that have been sprouted. It doesn’t mention toxicity. Sprouting, just like soaking, does reduce phytic acid, but not entirely. It is important to always cook kidney and lima beans, even sprouted. They contain toxins that are disabled through cooking. Eating even four uncooked kidney beans can be enough to require hospitalization! Hi! I just discovered your site today and can’t wait to explore more of your wonderful content and try some of your recipes. I have a question about sprouting. I am planning to try this at home, and your instructions are very clear. My question is about doing this in a hot climate. We live in So Cal and in the summer the temperatures range in the the high 90’s and often up to 105 and higher consistently. I would worry about bacteria forming in the sprouts. We don’t use air conditioning for environmental as well as economical reasons, so inside the house the temperature soars at midday, and doesn’t cool off much at night. Would it still be okay to sprout in those temperatures? If the sprouts don’t smell bad or feel slimy, is it safe to assume they are okay to eat? Maybe rinsing them more often is called for in hot weather. Any advice you could give me would be greatly appreciated. Thanks so much. That’s a tough one. I would say give it a good go, keep it in as cool a place as possible. Be willing to rinse 4 to 5 times per day. If they don’t smell bad or feel slimy, then yes, I believe you can assume they’re safe to eat. Also, you could consider eating them after a light steam. Let me know how it goes! Thanks for the fast reply! Perhaps when the weather heats up in a couple of months, I will try something like a zeer pot to keep them a bit cooler during germination. I will definitely rinse them several extra times per day. I will let you know how I do. In the meantime I will do some experimenting with sprouting. I didn’t know you could sprout so many different beans and such! LOL, I just got my husband to eat whole grain breads, now I might try some sprouted grain bread on him! Thanks for all the wonderful information – glad I found you! Hi Wardee! We have some lentils and are trying to find different ways to eat them when I remembered sprouting. How much water goes in with the 1 1/3 lentils? Do you have to use a super sunny window? Thank you. Thank you, Erin! 🙂 I will try it in my colander, then. 😀 Have a great day! I am johnny-come-lately to this convo – but I am glad I found this page. I just sprouted my first batch of sprouts ever (I sprouted several varieties). The bean sprout was the most confusing as to how to eat. When I read this – I went and tasted a sprouted azuki (splg? ), mung, and garbanzo bean – with the bean attached. Quite delicious!! Thanks for taking the confusion out of how they are supposed to look (:-) ), and also for Gilliebean’s question and your answer as to how they should be eaten. Hopefully you get this soon! I sprouted some pinto beans for refried beans. How long do I cook these before they’re done? I know soaked beans take a while, but what about these? Thanks so much, Wardee! I REALLY appreciate all your helpful info. Robin — They take about 30 minutes to cook after sprouted. It varies though, like it will be longer if you’re at a high altitude. Enjoy! Thanks SO much! I’m making burritos tonight for dinner and have yet to make the refried beans!! Kathy — I think so, but I’ve not done it to be sure the juicer can handle it. If it can, go for it. I’d watch out that you don’t have any digestive symptoms. If it is hard to digest, I’d lessen up on the sprouts and lightly steam or cook them instead of juicing. Hi. I’m trying to sprout some pinto beans. I soaked them overnight in a quart jar, rinsed 4 times, then left them on the counter for a day. The next day they had a terrible odor. I rinsed them 3 times, then left them again, and again they had a terrible odor. This is day three… no sprouting yet, and a terrible odor. Does this mean I have a bacterial overgrowth? Side story- I sprout my pintos for 2-3 days before cooking, occasionally I get busy and they get smelly and bad. I decided to use these in a fly trap as they were so stinky, Somehow the stink went away and it attracted no flies. Darn. I wanted to know if you are supposed to take the aprouts off the beans after they have sprouted, and eat them, or are you supposed to eat the sprout with the bean attached??? Ashley — You don’t need to separate anything. It is all edible! If the skins bother you, though, you can get rid of them. Or try, because it can be a tedious task! Hey there! Thanks for the post – i’m just getting into sprouting, and wondering if it’s best to sprout different things in different jars, or if you can sprout them altogether? For instance, i want to make a mix of lentils, moong beans, and barley. If I put them all in the same jar would the beans squish the lentils, or would they have different soaking/sprouting times? The main problem i might suspect would be different sprouting times – maybe they don’t mature at the same rate. Any thoughts on that? Thank you so much! Lalia — Generally you want to sprout separately because most everything has a different sprouting rate, plus the age of the seeds effects the sprouting rate. Having said that, I do mix red clover, fenugreek, and radish seeds for a salad sprouting mix. Beans, though — I sprout separately. Thanks for the comment and questions! Hi! I have just discovered sprouting and came across your site today while looking for answers! Hopefully, you can help me out with my dilemma. I have a sprouting questions. This was my first attempt at sprouting – and I think in the last 12 hours it went south on me. After much research, I decided to sprout 1/3 cup mung beans in a 64oz mason jar, and they were doing great! I read it was best to let the mung bean sprouts set for 24 hours after the final rinse, and that’s when things went wrong (I think). I was planning to harvest this morning and woke to find that my mung bean sprouts now all have forked roots and big green, twinned leaves!! (By big I mean less than a centimeter but still.) In the few places I could find this issue discussed, I guess it means my first batch is a bust because the sprouts will now be too bitter to eat. Is that correct? Can you tell me what/where/when I went wrong? They were doing so well, and had big and thick sprouts so I was so excited. If I can save this batch somehow, please let me know what to do and how. Even if it means saving some of them to start growing my own plants (maybe? ), I’m willing to give it a go! 🙂 I’m just disappointed that they look like they should be planted in the ground now instead of going into my dishes. 🙁 Any advice you can offer would be much appreciated. Thanks so much! Sylvia, I am very behind on these comments and your issue is long gone but I still wanted to answer that I am not sure anything went wrong. It just sounds to me like the sprouting time was too long. Perhaps your temperature was warm and they really took off. Anyway, try again, and don’t sprout so long. As for bitterness, they might be fine — taste and see (if it happens again). Sylvia; I know a lot of people that pay for these as they are now called “microgreens” and they cost a mint! I am trying to get a lady in her 70’s to grow her own for over a year now, buying her seeds etc, but she just hasn’t done it and is about to buy ready microgreens (sold in a paper bag) and complain about the price again. Wardee, I have just tried my hand at sprouting garbanzo beans in a Sproutman bag. This is my first time sprouting anything. I decided to do it to see if my daughter will be able to handle eating beans without getting the bloating and gas. Anyway, I’ve been rinsing faithfully 2-3times a day. Yesterday (the fourth day) I noticed that some of the skins/hulls have turned a vibrant purple… is that ok? I’ve got pretty long tails on some, while others are just poking out. I am hoping to cook them in the pressure cooker. Thank you for any advice you can give. Hi! Sprouting mung beans for the first time. I’ve noticed that some of the beans have become a darker shade and have light brown spots. Is this the dreaded mold I’ve read about? I am just sprouting for the first time… I soaked pinto beans for 24 hrs then have been rinsing 3-4 times/day and leaving in colander with tea towel on them. On day 3 now I think and there is a few that have sprouted. They started smelling after 1 day of sprouting. And they are slimy, but then I wash them. I am really not sure if they are ok, but why would they have gone bad? I am wondering if they are bad first of all, and secondly why? I have a large batch could that be it? the colander is full- are they supposed to kind of dry out in between rinsing? Finally sprouted lentils! SO EASY and SO YUMMO! Snacked on them all day and then topped them on our salad at dinner! One small question…do these little dudes make you flatulate? Because I highly gaseous today!???? In the morning (when you start off with the rinsed beans) do you leave the beans covered / floating in water until you drain and rinse them in the evening, then leave them overnight covered in water and repeat this daily, or do you sprout the beans in a rinsed and non-covered environment throughout the process? my mung bean sprouts smelled acidic and tasted very bitter. They were only 2-3 days old and only some had leaves. What could be the problem? I had used the metal screens for sprouting in jars in the past, but they rusted. I somehow warped one of my Excalibur dehydrator screens. So I took a wide mouth lid and traced around it and cut it out to use as a sprouting screen. I got about 16 screens from one sheet. This solved my screen issue and was very cost effective! where to purchase the beans? are they special beans or just dried beans in a bag at the store? Sprouting beans starts with dried beans. You can use any dried bean from a trusted source. We recommend organic dried beans.